The working group led by Prof. Margareta Müller is working on the production of 3D in vitro tumour models. Synthetic matrices (hydrogels) serve as the basic structure into which tumour cells, extracellular matrix components and "healthy" cells, such as endothelial cells and fibroblasts, can be inserted. In addition to diseased cells, healthy cells are also always found in tumours which, for example, supply the tumour with blood or build connective or supporting tissue. On the one hand the interaction between various cell types and the extracellular matrix can be examined in such a three-dimentional cell culture model, and on the other hand the effect of therapeutic drugs for tumours can be tested under realistic conditions. The goal of the work is therefore the development of 3D in vitro tumour models which are as similar as possible to in vivo models, e.g. in the mouse. This way the number of experiments on animals in tumour research can be reduced significantly. Environmental engineering: microplastics and pesticides - clean water? Process-integrated waste water treatment on site at the point where water pollution occurs. Clean water without antibiotics, anti-corrosion agents, sweeteners, pesticides, microplastics and other trace substances is becoming ever rarer as the standard industrial waste water processing systems and local sewage treatment plants (end of the pipe solutions) cannot completely remove the above-mentioned substances from the waste water. In the work group headed by Professor Dr. Andreas Fath, alternative waste water treatment processes are developed using "start of the pipe" solutions“, in other words where the waste water occurs. To analyze the effectiveness of the process on the one hand, and to test the water for content on the other hand, complex analytics are required. The test object in 2014 was the River Rhine, during the "Rheines Wasser" project. 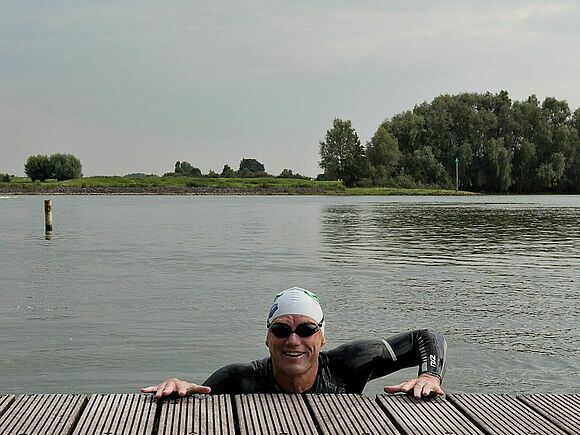 Professor Fath swam the whole length of the River Rhine from the source in the Swiss Alps to the estuary at the North Sea in Holland: 1231 km in the record time of 28 days! Every day water samples were taken, which were tested, some immediately and others later in a lab, for various forms of contamination. Additionally the first microplastics test of the river along its entire length was carried out using an HFU-built filter pump in cooperation with the Alfred Wegener Institute. A so-called passive sampler which was attached to the swimmer was also used in the testing of the Rhine. This absorbed 28 trace substances which were later extracted and analyzed (HPLC/MS) and finally identified through comparison with a databank. Various contaminants such as microplastics were shown to be present along the whole length of the Rhine. One of the main goals of this spectacular event was to make the general public aware of the importance of protecting our water. But what do the rivers in the United States look like? The answer to this question will be provided with the results of the follow-up project, "TenneSwim", carried out in summer 2017. Professor Andreas Fath swam the entire length of the Tennessee River in the USA collecting and analyzing water samples along the way. The results will be compared with the results from the European "Rheines Wasser" project. Lactic acid, proteins and antibiotics used in cosmetics and medicine are important biotechnology products. Efficient modern biotechnology processes aim to produce products of good quality in as large a quantity as possible, even when the composition of the source materials and substrates varies. To make this possible, process control strategies which can adapt flexibly to the relevant production conditions are needed. The project group headed by Professor Dr. Volker C. Hass has been researching for many years on such adaptive process control strategies including the ProTool project funded by the Federal Ministry for Education and Research through the Biokatalyse2021 research cluster. In the coming years, HFU will be working with partners from industry and science to transfer the research results to industrial practice. In biorefineries several marketable products including energy, are produced from biogenic raw materials such as grass, straw, cereals or wood as economically as possible. This is carried out at Furtwangen University in the Schwarzwald biorefinery. The focus is on the production of bioethanol, lactic acid, biogas and fine chemicals. The latter is intended to be used in the foodstuffs and pharmaceutical industries. Research is carried out on anaerobic bioprocesses with yeast and lactic acid bacteria. Modern bioreactors for lab and technical-scale production are available to do this. High-performance models and simulators also make it possible to further improve and optimize the processes. The eco-efficiency is evaluated with current programmes and databanks to produce lifecycle analyses (ecobalances).